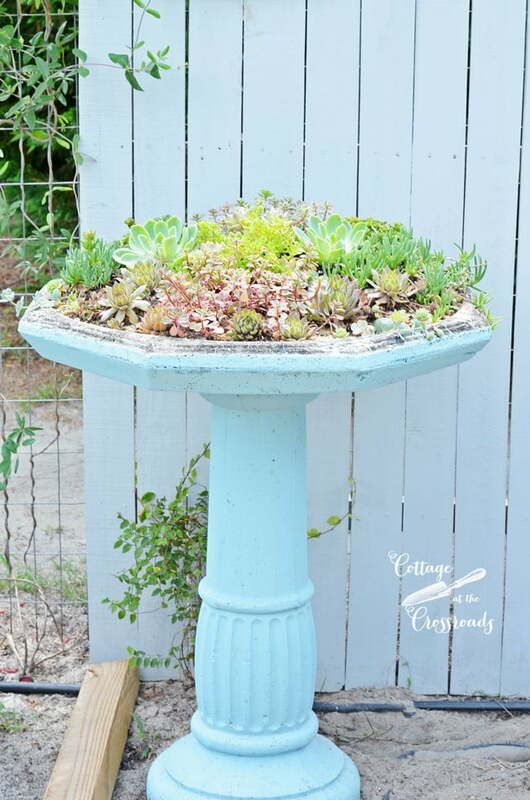 I have been meaning to show you this repurposed succulent birdbath planter for quite some time, but I had to wait until the succulents started greening up and growing this spring. I started this project last spring but I never got around to posting about it. In this photo, you can see a birdbath that used to sit in front of the arbor that’s in the flower bed in front of our garden. The birdbath got moved when we started constructing our DIY GARDEN WATERFALL. It was placed here in the garden in the spot where we were also working on our DIY FREESTANDING DECK. That heavy thing got moved around several times while we were doing all that work last year, and it was during that time that I discovered that the basin of the birdbath has a leak. After I stained these picket fence panels that we put up at each end of our deck, I decided to stain the concrete birdbath. At this point, I was thinking that I could repair the leak by putting some broken blue and white china pieces in the basin. 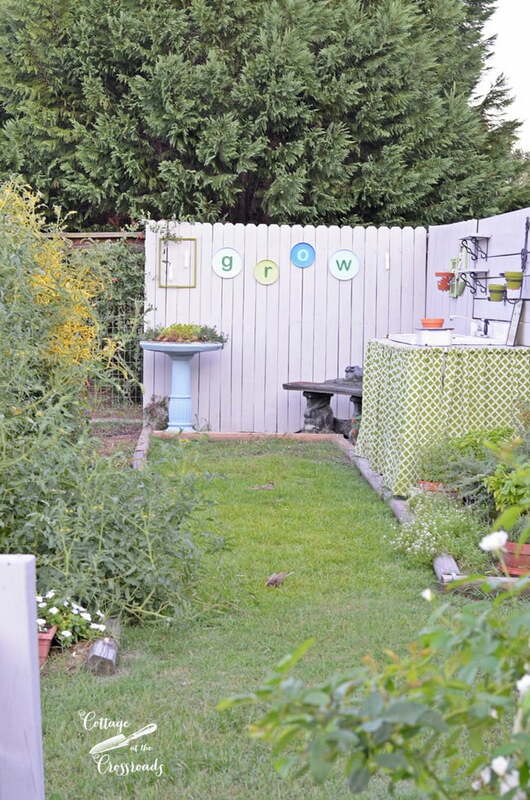 Wouldn’t that be pretty with the blue birdbath? Well, that project never got done so we moved the blue birdbath to this corner of our garden where the outdoor sink is located. 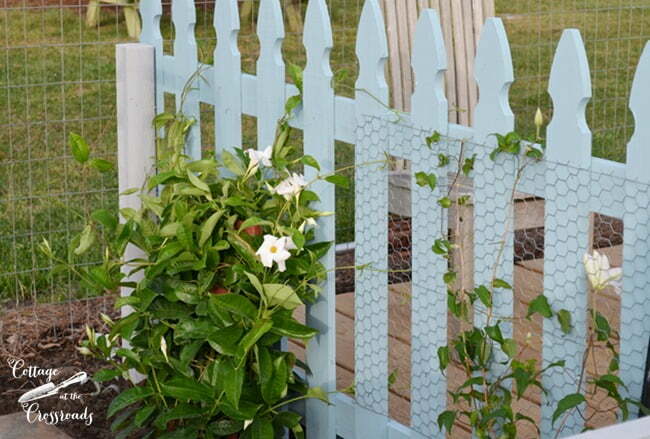 By the way, the solid color outdoor wood stain has held up beautifully on the fence panels as well as the concrete birdbath so if you ever want to change the color of a birdbath, just paint it with some solid color wood stain! 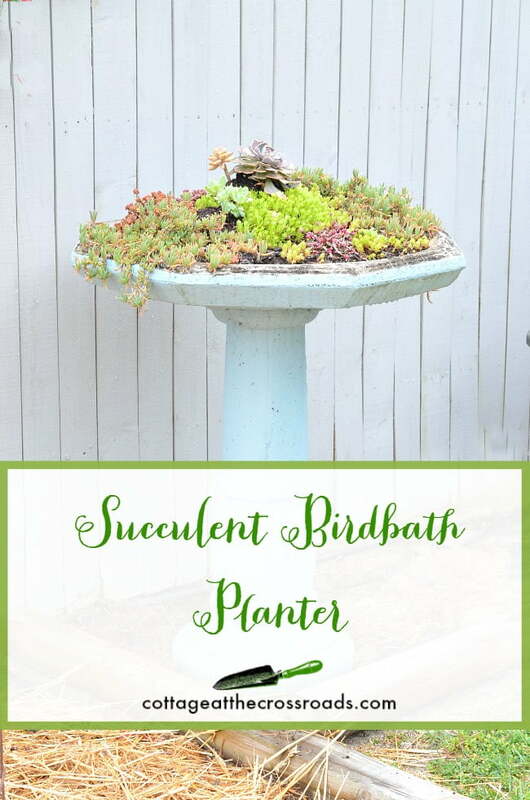 Since I already had a lot of succulent plants, I decided to create a succulent birdbath planter. I mounded up a mixture of regular potting soil and builder’s sand, but you can also use potting soil that is designed to be used with succulents. 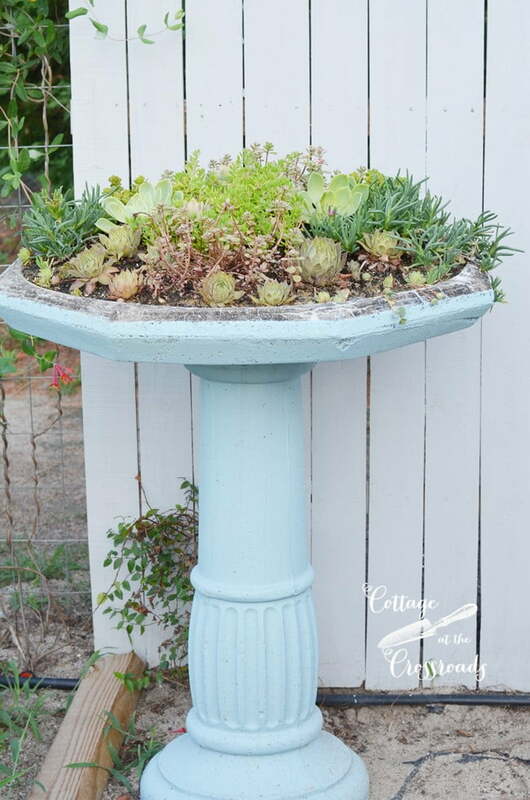 I planted the birdbath with a variety of succulents so that I would have a mix of colors and textures. 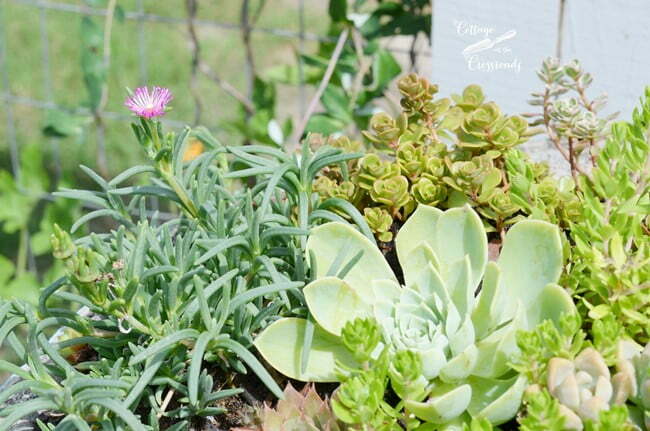 You can see an ice plant blooming in this photo. My sister-in-law Jean gave me some of her baby hens and chicks, and I purchased some sedums that I knew would spread quickly. 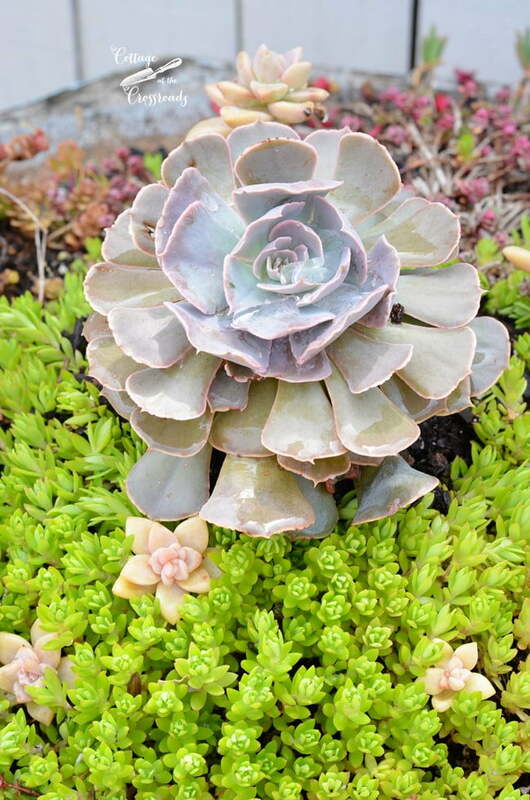 A few of the succulents and the ice plants were placed near the edge so that they would grow over the edge of the planter. 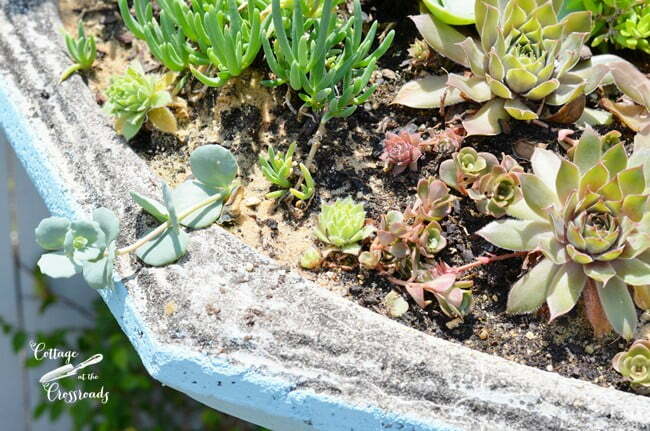 And the succulents grew over the summer and were quite happy in the birdbath planter. 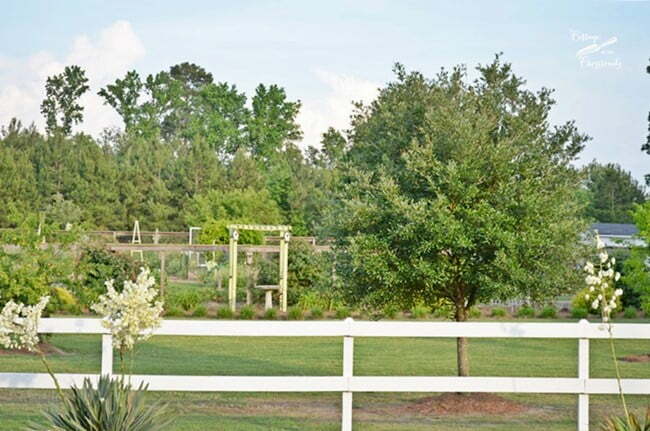 Beside the birdbath, I planted a honeysuckle vine called “Major Wheeler” and a creeping fig. I had big plan for planting more flowers and shrubs in this corner, but that just didn’t happen. And unfortunately, the creeping fig did not make it through the winter but most of the succulents did. 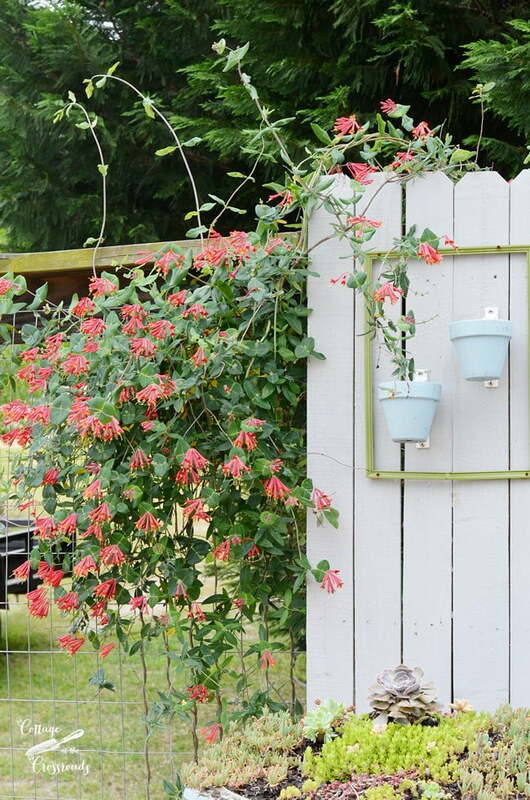 Look at that honeysuckle vine now!!! It has been loaded with blooms like this for several weeks. This little corner is coming to life with the succulent birdbath planter with the honeysuckle vine beside it. 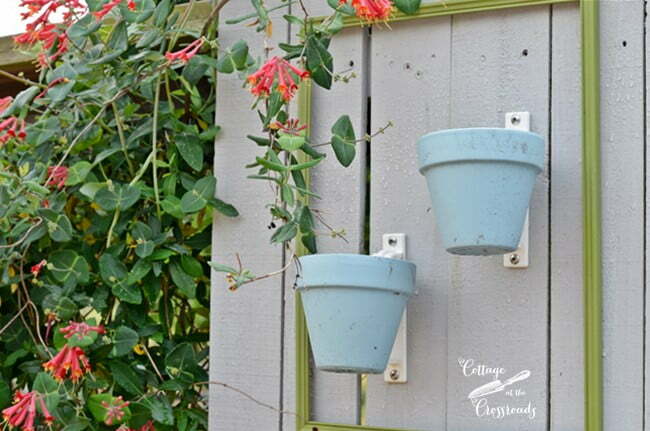 Just need to get these pots hanging above the birdbath potted up with something that will take the heat. The pots were attached with plastic pot holders that are available to purchase in our SHOP. The word GROW is still hanging in this corner. I don’t think I’ve ever really shared a tutorial on how I made that but if you’re interested, I can certainly do a quick post on that. Yesterday I did replace a few of the succulents with some fresh ones like this one you see above, and I have big plans for getting this corner in tip top shape. I hope you’re enjoying some beautiful spring weather where you are located. The All Things Creative Team and I will be back on Tuesday with more ideas for container planting. In the meantime, if you’d like to see more containers that I’ve created, just click HERE. And if someone doesn’t know what to do with a leaky birdbath, you can help them by taking it off their hands!!! 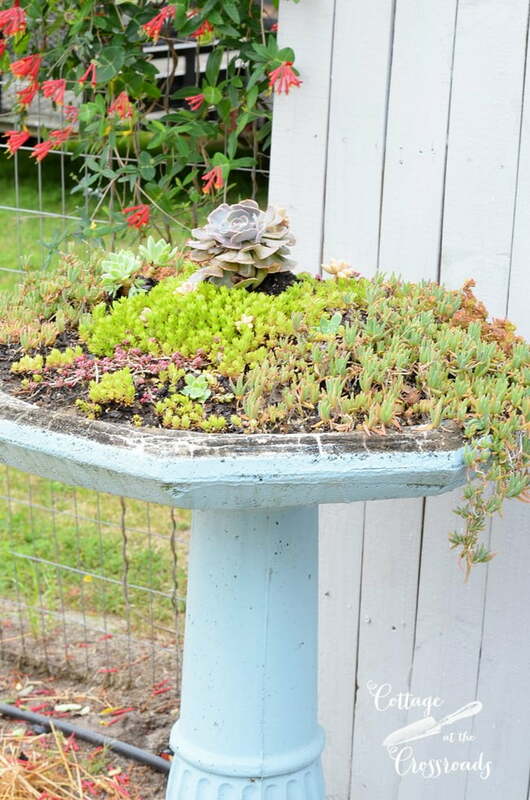 I like your succulent bird bath. I do have another inquiry. 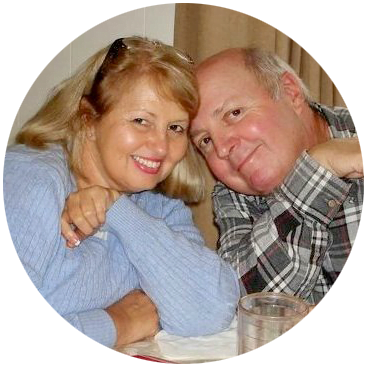 I was drawn to your blog because of a 2013 post on red drift roses. I planted some last year and they did ok. There were in a bit of shade so I moved to a sunny spot very much like your garden. They have buds. How long before I have those profuse blooms like in your pics? Any other suggestions will be greatly appreciated. Brenda, I think you’ll find that you’ll have many more blooms on your plants since you’ve moved them to a sunny location. I usually fertilize them in early spring but I didn’t get around to that this year so I’m waiting to see how they will bloom this year. I hope you get many blooms on yours this year! Hello Jane, I wanted to report that the red drift roses that I have are in bloom and are beautiful. Your bird birth has prompted me to plant some succulents. One day I hope to share some pics. So happy to hear that you have plenty of blooms this year! Mine are loaded, too! Love it Jane does it do well in full sun? Dawn, the birdbath is in full sun for most of the day but it does get a bit of shade late in the afternoon. As long as I have watered them when it was 90 or above, they seemed to do fine. I think getting a break from the hot sun late in the day helps! Thank you, Jean. I know you love that shade of blue! What a great idea! 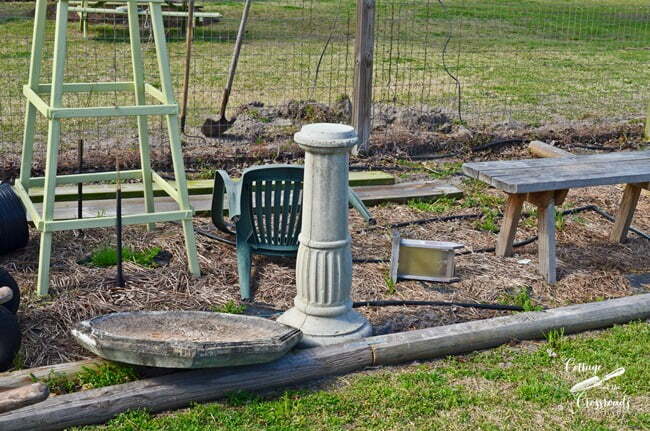 I have a large birdbath in my garden that needs something!! You just showed me what that is. Our weather is not warm enough for planting yet but I am putting the idea in my garden journal.. Thank you! 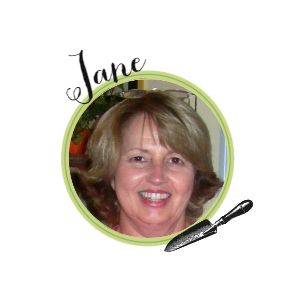 I’m so happy that you found an idea you could use, AnnMarie! So pretty. 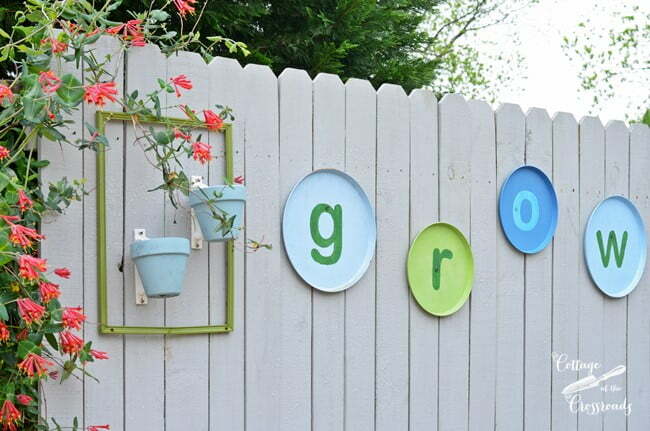 I love the grow sign, too, and would love a tutorial! I’ll work on that soon, Debbie! We are in hardiness zone 8, and it appears that you are in zone 7 which means your night time winter temps get a little lower than ours. I’m sending you a link to a list of hardy succulents that should do well in your area. We had a mild winter this year but I did put a heavy beach towel over my succulents a few nights when we were expecting a hard freeze. Perfect!!!! And I love the honeysuckle!! Me too, Dianne! 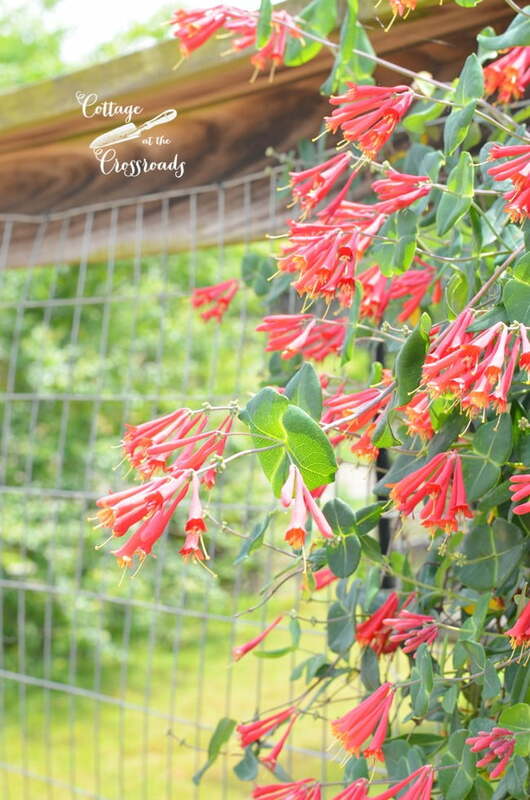 I think I’m going to plant 2 of the same honeysuckles around the front door. I have my eye on an arched support that I can train it on. What a great idea! Your honeysuckle vine is gorgeous! I’m going to go buy one for my garden. Do they come in different colors? Honeysuckles do come in different colors, Nancie. But I’ve only seen the “Major Wheeler” one that I have in the coral red color. I planted several 2 years ago, and they have really taken off this spring. I’ll show more of them soon. I love sedums too, Mary! I’ve even put them in hanging baskets.